Teach To Stamp: Happy Thanksgiving! Come see what I'm stamping today! Every year I make cranberry sauce for the kids teachers and my coworkers and family. 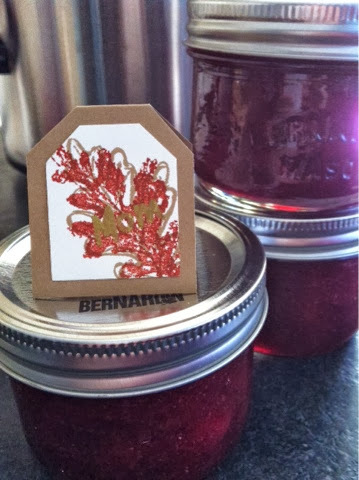 This year with kids in two different schools I made 40 jars so the labels needed to be quick and easy. I simply stamped the leaf and outline images from Gently Falling onto Very Vanilla card stock and punched them out with the large tag punch. I wrote people's names with a gold Stampin' Dazzle marker, and if they needed to be signed (the ones dropped off at the high school) I mounted them on a 1-3/4 x 4 piece of Baked Brown Sugar folded in half. For one week only--25% off 25 stamps! !